The summer of 1987 was pivotal for me, but not because I turned 21 and could legally drink. No, the summer of 1987 was the year I met Brent Vaughan. Some friends and I decided to try and get served at a local bar despite the fact that two of the three of us were underage. Luckily, nobody carded us and we got to stay. The band that night was a local group called The Bluesberries. I had never heard them (since I was underage), but loved the fact they had a sax player. I was taking tenor sax lessons and told my friends I was going to ask the guy to dance. They laughed at me for being so bold. Maybe it was the beer that gave me courage, but I asked the guy to dance and we spent the rest of the evening together. When the time came for us to part, he asked for my number. Within hours he’d called to ask me on a date for the next night. I said yes and we were inseparable for about 2-3 months. During that time, he opened my eyes to all kinds of new music. I was a classical/opera girl who listened to Buddy Holly on the side. He was a jazz musician who listened to Stan Getz and Michael Brecker. I introduced him to Eddie Cochran and he introduced me to, well, everything. Throughout the years we stayed in touch. It’s funny, because technically he’s an ex-boyfriend, but I don’t think either of us thinks of the other that way. He’s just my friend Brent. Whenever we’d meet, he’d recommend something new and I’d buy it – just like that. My dad and Brent are just two of the very few people whose musical recommendations will do that to me. They know their stuff. Unbeknownst to Brent, his influence may have played a part in my relationship with Steve. The night of my first date with Steve, we started listening to music. 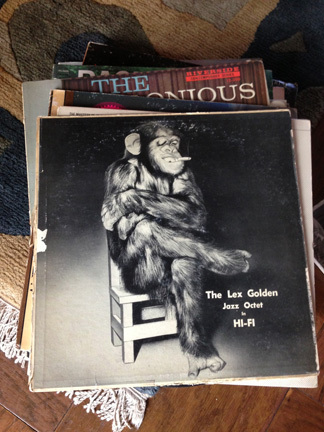 I had a stack of CDs in the car, and brought in Getz/Gilberto. Steve loved it so much, I actually loaned it to him (something I NEVER do). I had that CD because Brent told me to buy it. The rest, they say, is history. The invention of Facebook has made the world a much smaller place and has allowed me to reconnect with many people, Brent being one of them. We’ve stayed in touch and managed to get together from time to time and talk music. Steve and I have heard him play with several bands and we all enjoy each other’s company. 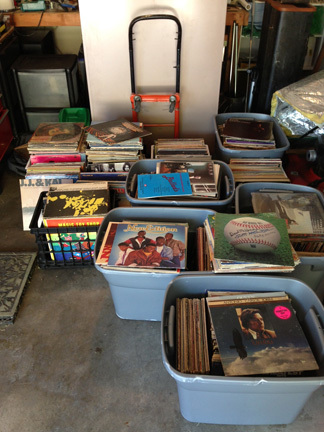 A few weeks ago, Brent messaged me to tell me he was downsizing and wanted to give, yes give, me most of his incredible LP collection. I was stunned. I mean, I know what this music means to him since I’m the same kind of person. No money, no favors, just a gift. He cautioned me that not everything in the collection is great and I could expect some duds, both musically and conditionally . Saturday, he and his girlfriend Laura packed up the ENTIRE flatbed of her truck and hauled the collection to our house. Wow. He had warned me that it would be extensive, but I wasn’t prepared for this! I haven’t listened to it, but this has to be the best album cover I’ve seen. Crack me up. In the meantime, Steve and I grab a few at a time, bring them into the dining room, where the best turntable resides, and jam. This morning, I visited my old friend Eddie Cochran and got my day going. Tonight, I’ll decide what to play based on my mood. I’ll keep posting the gems I find. Thank you, Brent, for such a great, generous gift. You can bet Steve and I will give them a good home for decades.